September 22 is Hobbit Day! It's the day Bilbo Baggins and Frodo celebrated their birthday at the beginning of Fellowship of the Rings. You can celebrate the occasion with music from the Irish & Celtic Music Podcast. I shared the entire album in show #128 in 2012. If you enjoy it, you can go to http://hobbitsongs.com/ to buy all of my hobbit songs. Listen and subscribe to the Irish & Celtic Music Podcast at http://celticmusicpodcast.com/. 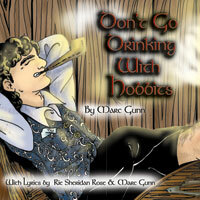 This week’s show is a special feature on Marc Gunn’s latest album Don’t Go Drinking With Hobbits. While you can enjoy the album in its entirety for free, I want to ask a special favor from you. At noon CST on September 22, 2012, I want to push the title track “Don’t Go Drinking With Hobbits” to the Top of the Charts on Amazon and iTunes. I need your help. If you enjoy the album or the title track, please consider buying the single and/or the album on that day, at that time. Your simple purchase will help to push this single and album to the top of the charts and will also help promote Peter Jackson’s The Hobbit movie in December. All it takes is a mere 99 cents a little bit of time. If you can’t remember to buy it on that date, then sign up to my personal Top the Charts mailing list (not the same as the Irish & Celtic Music Podcast Top the Charts list) at celticmusic.org/DontGoDrinkingWithHobbits/. And whether you plan to buy the single or not, share the URL above with your friends. Anyone who loves the The Hobbit or fantasy music or sci fi conventions or Renaissance festivals will love this album. So share, share, share. Your simple contribution will go a long way to helping me change the way you hear Celtic music. I’m looking for other podcasts interested in sharing this show on their podcast feeds. Let me know when you post it and I’ll get you added to the roll call. Thanks!